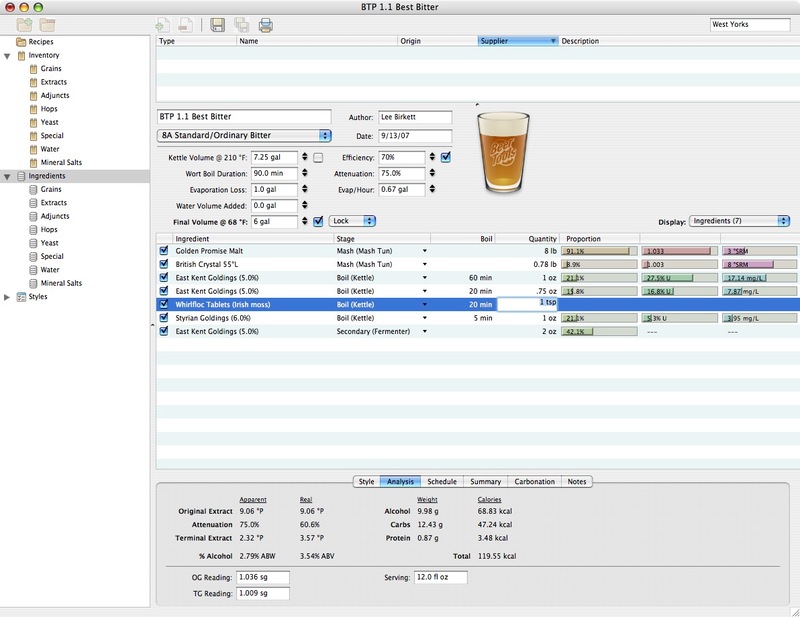 more features for extract and specialty grain brews. Maybe a more intuitive interface for the mash schedules. jawbox wrote: more features for extract and specialty grain brews. Maybe a more intuitive interface for the mash schedules. Heh, heh. I think they mean feature requests after we have had a chance to look at what is included in the new version 1.1 -- which hasn't been released yet. Perhaps I'm missing it, but I would love to be able to select the color formula that BTP uses (e.g., Morey, Noonan, etc.). We discussed this somewhat in the other BTP features thread. I provided all the formulas and would be happy to post them again if you're interested in implementing this feature. This feature could go under the Recipe pulldown menu next to utilization. Last edited by TCBrewguy on Sun Sep 16, 2007 11:05 am, edited 1 time in total. I would really like the ability to add ingredients by simply double clicking on them. In the same manner, I would like to be able to remove items from my recipes by either simply hitting 'delete' or possibly Apple-Delete. I like hot keys! Double click is reserved for edit. Perhaps control click would be a good way to handle this. lathe wrote: Double click is reserved for edit. Perhaps control click would be a good way to handle this. Yeah, totally. Either that or Apple-Click. edit: To be honest, I think after I get used to the drag-and-drop feature, this may not be necessary.end edit. Also, when adding hop addition specs, would it be possible to make tab toggle between the two editable fields? In other words, when I enter the hop addition time and hit tab it would go to the hop amount field. And one more thing...I noticed when I double-click on an ingredient, I have the option of changing its measurement unit. When I change that unit, however, the change is not being reflected in the main recipe window. 1. During an install, most programs will automatically add an program icon to the desktop, or at least ask if you want to add one. BTP1.1 does not. No big deal; I went to the program menu, made a copy of the shortcut and then dragged it to the desktop, but to polish the program, that shouldn't be necessary. I have also pinned the program to my start menu. 2. Using the menu command "Online | Forum" causes the forum to open in Internet Explorer, despite that my default browser is Netscape; this occurs whether or not I have my Netscape browser open. I don't know what it does with other default browsers. Very minor requiring that I simply cut and paste the URL into a new tab in Netscape, but the program should EVENTUALLY check for an open or default browser. 3. I notice that there is no UNINSTALL feature in the program menu; this is not necessarily a problem, but since I had such a problem a month or so ago, if the Windows Uninstall is not the best way to do this, then maybe BTP could EVENTUALLY have a dedicated uninstall program. ability to change measurement of special ingredients. Right now you are locked into the universal measurement in the preferences. Example Whirlfloc is an each item where irish moss would be measured by tsp etc. jawbox wrote: ability to change measurement of special ingredients. Right now you are locked into the universal measurement in the preferences. 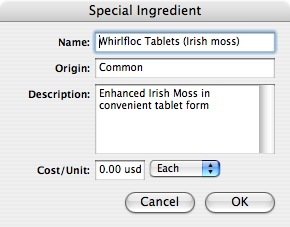 Example Whirlfloc is an each item where irish moss would be measured by tsp etc. Not sure I understand. BTP won't allow you to enter 1 ea, 2 ea, etc? I think the preferences of tsp overwrites it. I'm unable to set it to each. I can change the cost to each when you open it up from the recipe, but thats all. Search function is nice for adding ingredients but now I have to remember that some things are in my inventory and not the databases examples of wyeast VSS that I've added. Also noticed that now the yeast product numbers are not shown when you search, its easier to type 1056 than california ale yeast. I'm still think that you should be able to add to the master database rather than having two seperate entities for ingredients. Step backwards in my opionion. jawbox wrote: I think the preferences of tsp overwrites it. I'm unable to set it to each. Units must be specified as abbreviations. Have you tried "ea"? jawbox wrote: I'm still think that you should be able to add to the master database rather than having two seperate entities for ingredients. Step backwards in my opionion.